This season saw a particularly excellent crop of cookbooks come to the forefront. 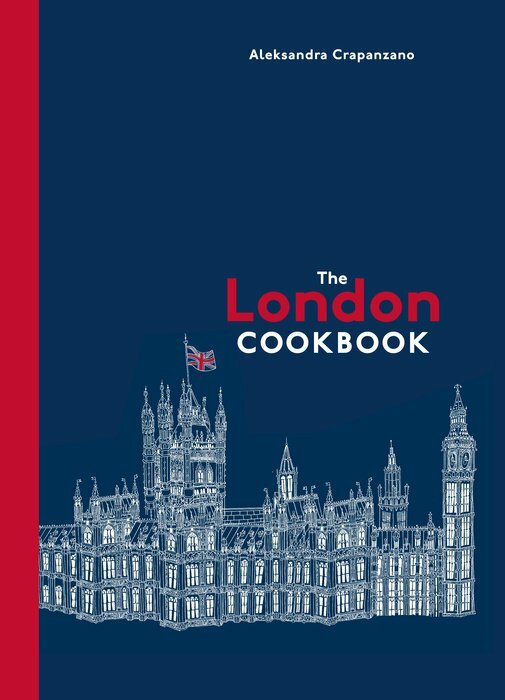 But one that stood out for me was The London Cookbook by Aleksandra Crapanzano. When my copy came in the mail, I opened up the stately, deep blue cover, which revealed enticing pages of spectacularly simple, fresh food, the kinds I like, that are being cooked in London today. Spiced Carrots with Freekeh and Labneh, Taktouka (harissa-spiced Berber vegetable stew), Ras el Hanout and Buttermilk Cake, and Burnt Orange Chocolate Sorbet, turn the image of British cooking upside down. Like most cultures, chefs, cooks, and bakers in London have adapted ingredients, flavors from other places and cuisines, incorporating them into theirs. And they’ve done it well. Still, there are Potted Shrimp, Roast Corn and Chorizo Chowder, Short Ribs with Chickpeas and Swiss Chard, Treacle-cured Pork Belly, and Ginger Spiced Steamed Puddings with Rum Syrup, in The London Cookbook, that hew closer to home. I know from firsthand experience that London restaurants and bakeries have revised what we think of British food, and Aleksandra’s book isn’t just a collection of recipes, but one of those books that you’ll want to sit down and read (like I did), for the colorful stories that take you into London kitchens, behind the scenes of the food revolution there, with photos that will make you bookmark many of the recipes as you go, as I have. It was in Paris that I learned to shop. Or should I say, I learned to respect the art of shopping, as my allowance only went so far. I was only ten when we moved to Paris, but, even then, I loved to peer into the shop windows. The bottles of vintage Calvados and Armagnac in the window of Maison Ryst Dupeyron on the rue du Bac held a special allure. If I put my face to the glass, I could make out the wood-paneled walls, the warm glow of the lamps, the wood desk with its leather ledger. One day, my parents took me inside. It was glorious. A serious place. A place of history. Bottles dating back a hundred or more years. The propriétaire offered my parents a taste of Calvados, as they were choosing a bottle. My father held his glass out to me to sniff. The beautiful, haunting smell was fiery with only a whisper of apple to temper the flame. It was heady. It was grown-up. I fell in love. Whenever I smell Calvados, I remember that moment at Ryst Dupeyron. That moment that forever linked the scent with the discovery of my new city with the taste of adulthood. It is perhaps, then, no wonder that I adore this cake. I first had it at St. John, the well-known restaurant in London belonging to Fergus Henderson. Fergus may have spearheaded the nose-to-tail movement, but he is also a fervent baker. His bread, his doughnuts, his gingerbreads are beloved, but this cake, needless to say, stole my heart. We were lunching together, and, when you lunch with the chef, there’s little reason to order. I didn’t know what was coming. In fact, after several hours of deliriously happy eating, the very thought of dessert hadn’t occurred to me. I smelled it before I saw it. That apple fire I love. As the waiter set a slice of cake down before me, the scent of Calvados seemed to rise like an invisible fog. I stepped right into it. Fergus must have seen my pleasure, as he offered me the recipe, which I offer now to you. I was meeting him while researching my book, The London Cookbook. Fergus has had an enormous influence on the culinary world of London, helping to dig it out of a 1000-year rut and into an era of terrific change. So enormous, in fact, that I include, in the book, a family tree of all the chefs who worked at St. John and have since gone on to helm great restaurants of their own. Fergus remains a mentor, a force of joy, and an inspiration to almost all of them. But his influence reached further. He helped a city fall in love with food, and he did it without pretension or fuss but, instead, with great craft and generosity and little more than whitewashed walls and wood tables. The food in London today is not the food one remembers from even a few years ago. It is bold, vibrant, international and worthy of the excitement it has generated among locals and foreigners alike. Fergus himself is known for bringing the best of British food to the table, but he is the first to say that his influences are French and Italian. I say he has taken the best of all three and married them to delicious effect. This cake is a perfect example. It’s a rustic cake that would be equally at home in Normandy, a Parisian apartment, a house in the Cotswolds, as it is in one of the best restaurants in London. When I wrote The London Cookbook, I was looking for recipes just like this one – recipes that are generous, relatively simple, seasonal, confident… but which have that little something that elevates them from good to great. When you smell the Calvados and apples baking in the batter, you’ll know what I mean. A few notes: The apples are meant to be roughly chopped, but if you are a perfectionist or serving this at a formal dinner, dice them into neat half-inch cubes. If you are allergic to nuts, simply omit them. Recently, supersized apples have started to appear in supermarkets in the United States. One supersized apple is roughly the equivalent of two good old grannies. Granny Smiths, being the best option, unless you have access to the wonderful Bramleys, grown in the U.K. If choosing a sweeter apple, you may want to reduce the sugar by a few tablespoons. And if splurging on a bottle of Calvados isn’t an option at the moment, Clear Creek, an Oregon distillery, makes a delicious apple brandy that is aged in French oak casks for eight years. Just remember, this is a big, generous cake. It will keep a day or two if you put it under lock and key. 1. Preheat the oven to 350ºF (180ºC.) Generously butter a 9-inch (23cm) springform pan, or 10-inch (25cm) round cake pan. 2. 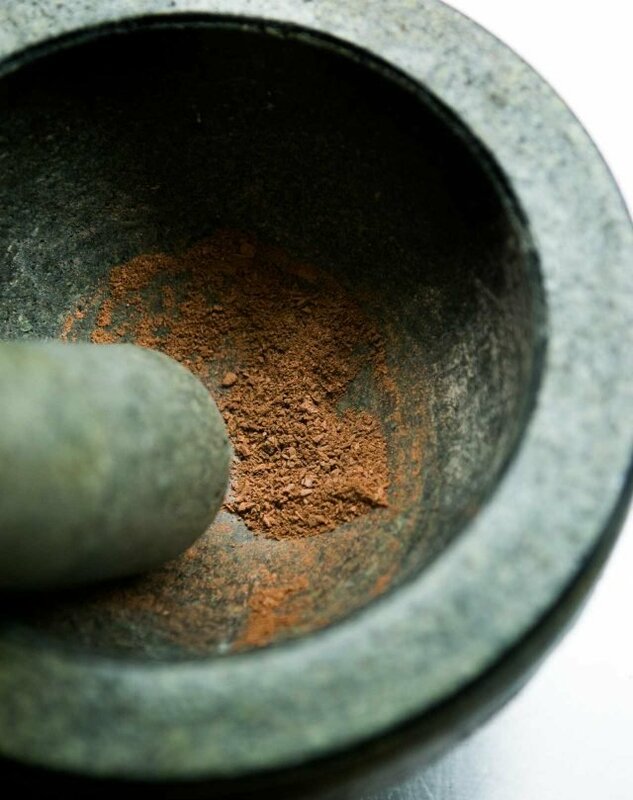 In a medium bowl, whisk together the flour, cinnamon, cloves, baking soda, and salt. Set aside. 3. 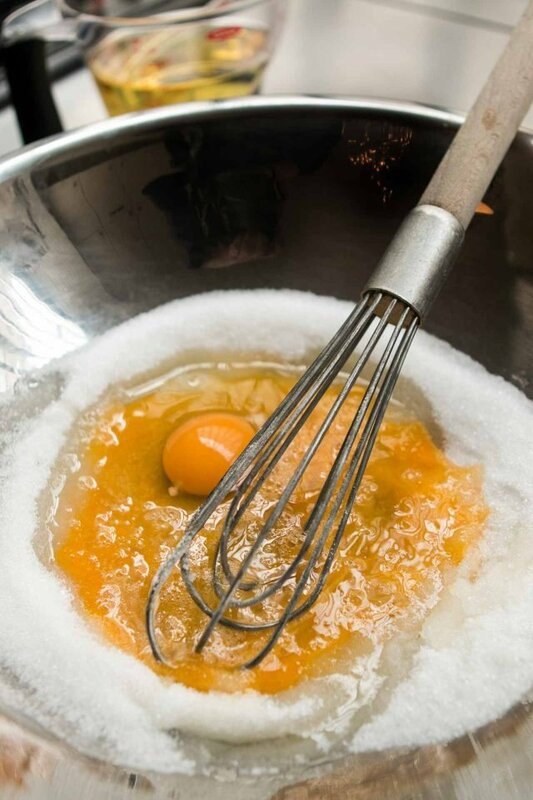 In a large bowl, whisk together the sugar and the eggs. In a slow, steady stream - as if you were making mayonnaise - whisk in the oil, stirring constantly as you pour, to keep it emulsified. Whisk in the Calvados. 4. 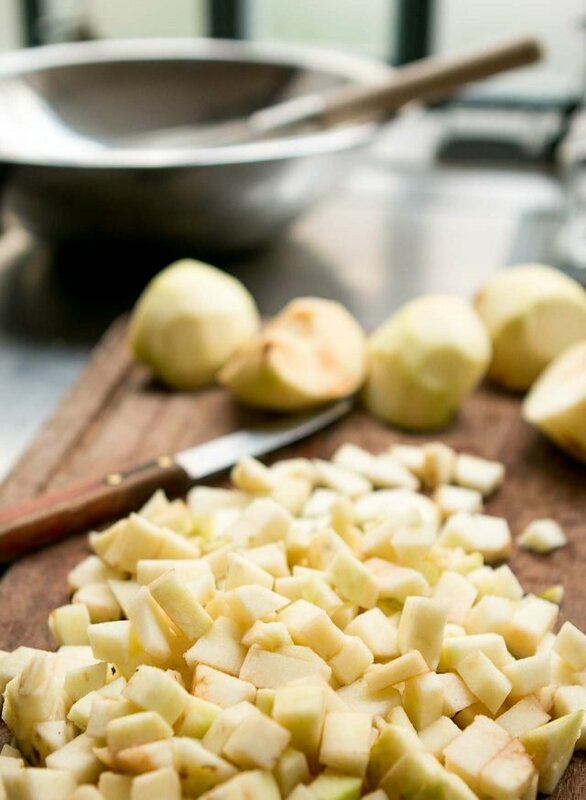 Using a spatula, mix in the dry ingredients, then fold in the diced apples and nuts. Scrape the batter into the prepared cake pan and bake for 90 minutes. Because the cake is so dense, it may feel done on top (and a toothpick inserted into the center may come out clean), but it will likely need to full baking time for the cake to be cooked through. 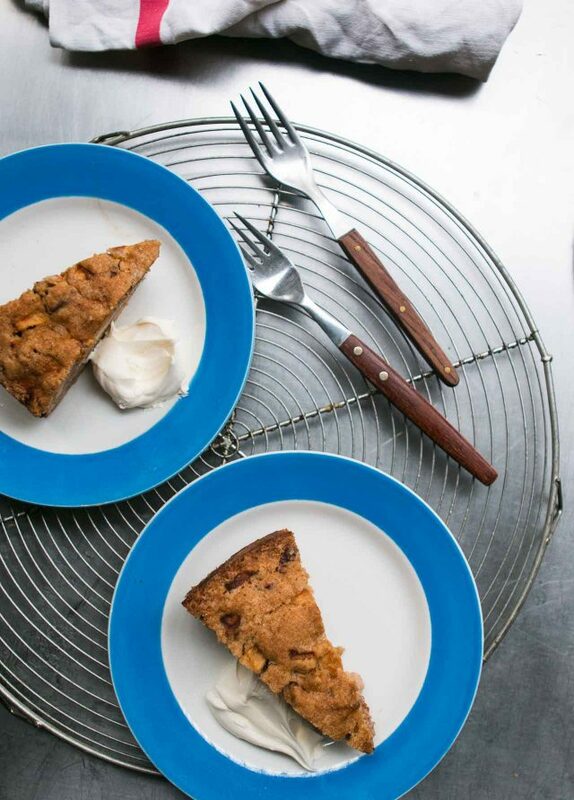 Serving: This moist cake can be served on its own, or with a spoonful of crème fraîche, or ice cream, if you wish. Storage: I found this cake will keep for 2 to 3 days at room temperature. I would avoid freezing this cake as the apples may become soggy. Glorious writing. I don’t want to say like a modern M.F.K. Fisher, because you are you and not her, but please take it as the highest compliment. What a lovely comment to wake to this snowy tumultuous morning in New York. Thank you. 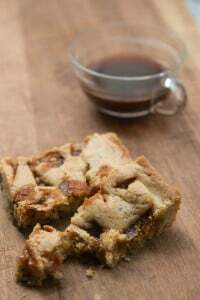 I LOVE apple cakes, and this one looks so comforting and just perfect for the winter! I have to invest in Calvados..I always think..I don’t need all that..for all the times I have thought tha..I could be on my second bottle by now..looks great! Should the cake be baked for a full 90 min at 180ºC.? Is there a way to tell when the cake is ready? It’s hard to tell when it’s done but it’s a very dense cake and mine took the full 90 minutes. I think it’s such a big, generous cake that even baking it for a few extra minutes wouldn’t hurt it, but still, one I made that I took out after 1hr, 15mns, still has some gooey batter in the very middle, so it needed the full 90mn. Are you able to give us the internal temperature it will be when fully cooked? I’d love to bake this cake, but I’m nervous about underbaking it. Ellen N… I haven’t made this cake so can’t comment directly. But there’s quite a range over which most cakes can be ‘done’ (say 85-96C, 185-205F), depending on things like sugar concentration, egg and fat content, starch gelatinization, and several more. I usually shoot for 91-92C (195F) and that seems to work as a rule of thumb. But, at the end of the day, it’s difficult to beat the standard visual, touch and toothpick tests which, in my experience, are as reliable as any probe thermometer. I just made one. After 99 minutes it was 90% done, but we liked the slightly gooey center. Next time I might bake a bit longer. And there will be a next time… it was a big hit with the family! P.s. I used a mix of Granny Smith and Fuji apples. The calvados i have on hand is 70% alcohol- can I cook with sth with that high content of alcohol? such as in this cake? 70% alcohol? No, you shouldn’t use it. You should send it to me. I was just looking at a bottle I’ve used with success. It is 40% ALC by VOL and 80% PROOF. Does that help? If not, I’d be happy to contact a spirits expert. Fantastic winter cake. Calvados is so spectacular. The addition of the nuts creates a good texture for this cake. LOVE anything by Fergus Henderson. This cake sounds glorious. In the US, for a Bramley apple substitute (although Bramleys can actually be obtained from some small orchards here in New England), may I recommend the Baldwin or Rhode Island Greening, among others? The Granny Smith, while widely available, is really an eating apple and too wet/juicy to make a good apple cake. 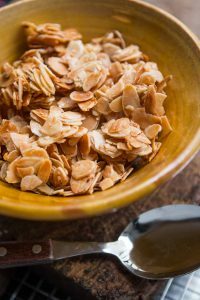 If you are really fortunate you may find the Belle de Boskoop (a Dutch variety that has been successfully grown in the US and is once again becoming increasingly available) which is really the best cooker around in this long-time baker’s opinion. Hope this is useful. Granny Smith is an Australian apple cultivar and regarded almost entirely as a cooking apple in Australasia and Europe. The sourness is the plus! Well, this Brit thought Granny Smith an eater – but could be cooked, whereas you’d know if you bit into a Bramley. Oh, and they’re generally rather larger (at least in the days I picked them at my uncle’s farm). Having said that, my orchard includes Adam’s Pearmain, which we’ve always eaten, but is listed as a cider apple. Not sure about Granny Smith, but Bramleys cook into a froth (as does Mutsu aka Crispin, also in my orchard), not sure how that would affect the result. And 9 months before I can do any controlled experiments! Wonderful post – printfriendly will be used for this one (to keep all the header text and photos). Thanks DL and AC. When I was in London some years ago I was staying near a Sainsbury’s, and I discovered Bramleys. They stripped off the inside of my mouth, they were so incredibly tart, and they were so hard that they ripped up the insides of my cheeks. Which did not prevent me from eating one or two every day! I still remember them and hope to eat them again! Looks great and I do have a bottle of Calvados. I have never understood recipe writers’/cookbook authors’ predilection for Granny Smith apples, which I find sour and dry. David, because you write books, a loving tip regarding a common error: “infer” means “glean,” “deduce,” “conclude.” The person who suggests, or hints at, something “implies” it. I am comforted by knowing this recipe exists in the world. I’m comforted by your writing and by Fergus and Alexandra. Difficult times here in the US and comfort food is welcome if only in the writing of it. Thanks. THANK YOU! I’ve asked for an apple calvados cake for years, I had one at the Henry Ford Musuem and home in Detroit of all places and have been looking ever since! I made your candied Citrone last month. I bought this Citrine as big as my dog’s head. It’s like lemon candy! I have it in mason jars in the fridge. Thank you for all you do! THANK YOU! I’ve asked for an apple calvados cake for years, I had one at the Henry Ford Musuem and home in Detroit of all places and have been looking ever since! Thank you for all you do! I have been living in London for very many years and I agree that the quality of restaurants has improved a lot. However, I feel that the average quality is still mediocre, for different reasons. There are issues of availability and of lack of knowledge. Apart from few, generally very expensive exceptions, food shopping in London is still pretty depressing – try and compare a London street market with a French/Italian/Spanish one. There are fewer and fewer food shops, I mean “normal”, neighbourhood shops. There are exceptional food shops, but these belong to the rarified world of the wealthy. There is not much “middle ground”, I find. There is also a generalised lack of knowledge amongst food professionals, which does not help. Many young chef are totally unaware for instance of the existence of a glorious local cousine and when they venture into other cultures’ food, the results can be scary – endless risotto enriched with with crème fraiche spring to mind. There are loads of new bakeries now all selling the same type of Tartine-derived bread, but it is impossible to find a traditional English cottage loaf. A focaccia that does not resemble a pillow or a baguette that is really well cooked are still pretty hard to find. River Café, St John’s, Quo vadis, Moro, Bibendum, Locatelli, Pierre Kaufman, Sally Clarke, The cinnamon club, Mazzei, Angela Hartnett, Anchor & Hope ecc…), but they still represent the (often very expensive) exceptions. I have not make this cake yet, but I agree with one of the previous comments: anything from Henderson is a winner- thanks for sharing. 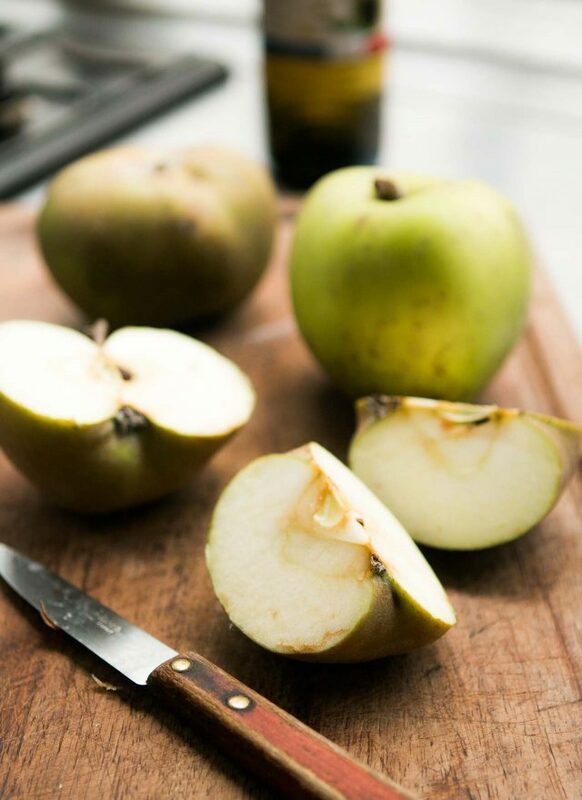 I love the way Calvados infuses and deepens apple flavor – especially the more dense recipes. A lovely post, thank you. Just discovered your blog and already made your French apple cake, 4x in 2 weeks (2x for me, 2x for guests). The comments for that are closed, but just wanted you to know that I absolutely love it! 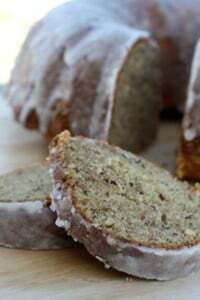 I will try this cake this week – it may be just the right alternative to satisfy my predilection for boozy apple cakes, lol. Thanks! I have some McCoun and Winesap dried that do well with baking when fresh. Would re-hydrating them hurt the batter too much? Wondering if they would actually not be moist enough. PS: if you get to NYC in october there are some great orchards in NJ that have a large variety. I believe there is a small error in the recipe. If 2 cups of flour are 400 g, 1.5 cups should be 300 g not 350 g.
I use 1 cup flour = 140g, so 3x that is 420g+35g (1/4 cup) = 455g, unless my math is wrong. I’ve not seen a measurement of 1 cup of flour equaling 200 grams. Is that what you usually use as a conversion? David, I think Keith was referring to sugar not flour, and your comment that the sugar could be reduced? It is a New Mexican distillery so no wall climbing will be necessary to obtain a bottle. That’s a great idea. And thanks to your husband for his service to both countries! Thank you for the recipe. It was a HUGE hit to our evening! P.S. David, we met at Darina’s “Literary and Food Festival at Ballymaloe”! Thank you for sharing your story! Greed has ruined the reputation of the Granny Smith apple because commercial growers pick apples before fully ripe. Mature apples are sweet and crunchy! I know because I grow my own Granny Smiths. I remember when I was a pastry chef/baker in Northern California and one of the apple growers brought us a case of red Granny Smith apples. I thought they were a different variety but they said, “No, it’s just that most Granny Smith apples are picked underripe.” They were a lot sweeter, and fuller flavored, than the green Granny Smith apples that I was used to. In general, I try to buy my apples from a producer or grower, or from a place that sells apples like that because they’re so much better than commercial varieties, although I realize that some people don’t have that option so try to include a variety (when I can) that’s more widely available, too. This looks divine! My other half is from Calvados country so we always have loads at home. Will have to give this recipe a try! You have brought to mind for me wonderful memories of dining at Cher Albert on Av. du Maine with my parents! I confess I still have a beautiful painted ashtray as a remembrance. The owner was from the north of France in Calvados country and the food reflected this. The other vivid memory was he had an enormous dog who liked to park himself right in front of the restaurant’s entrance so in order to partake of the delicious fare one had to take a giant step over the ‘mascot’ who never even twitched an eyelash when the patrons jumped over him! I have always had a bottle of Calvados in my kitchen and love to splash some in my Thanksgiving veg dressing! Thank you for your thoughtful February newsletter. These days I hesitate to look at social media due to its vitriol. 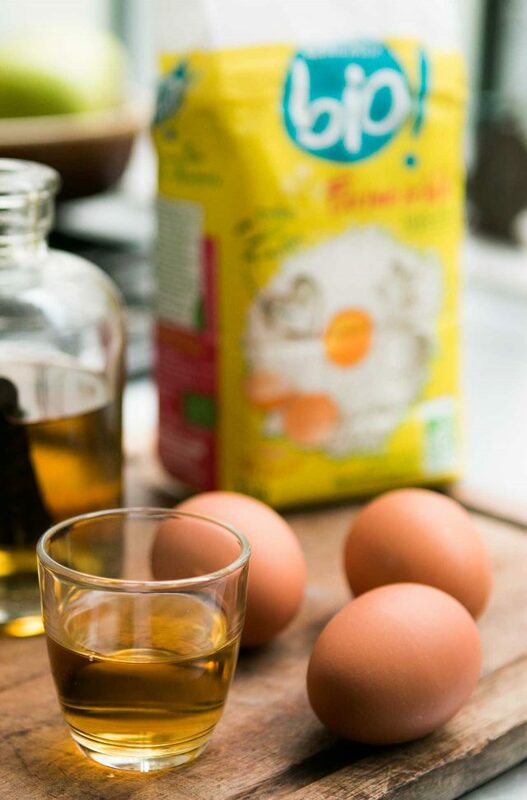 Your practical advice and perspective in addition to this Calvados cake recipe are appreciated by this reader. Figuring that I could never use up enough cake for 10 people, I halved the recipe and it worked beautifully. Halving the three eggs involved keeping 2 yolks and removing some of the white, and I kept rather more than half the given measure of Calvados (because hey, how could too much Calvados be bad? ), but everything else was straightforward. I used Honeycrisp apples, because that’s what I had in the fridge. I eyeballed the mixture when it was complete and decided to use a 7×11 inch rectangular pan. No doubt this made the cake less tall than it ought to be, because it baked in about 45 minutes. I expected, I’m not sure why, a fairly dense and heavy cake, but it’s actually feather-light. And as moist as promised, and absolutely delicious. Just licked the crumbs off my plate of this warm, perfect winter cake while sipping calvados. Could more be added to the recipe without compromising the outcome? I was desiring a little more calvados infused flavor. Thank you for the recipe and evocative description of this wonderful golden liqueur. I’ve not tried it with more Calvados so can’t advise. If you do it with more, let us know how it works out in the comments. You could brush the finished cake with Calvados, or make a Calvados syrup for brushing the finished cake, to add more flavor. Calvados syrup-excellent idea! I will keep you posted. I made this cake yesterday and was disappointed. Rather than call it a cake, I would call it a giant muffin! I used the full amount of sugar and the cake is not sweet at all. I think that it could have used more sugar. I used Granny Smith apples, but the apple flavor of the cake was not very strong. I was concerned when I added the batter to a 9-inch springform pan as the batter nearly filled the pan, but it did not overflow in the oven. It did indeed take a full 90 minutes to cook.